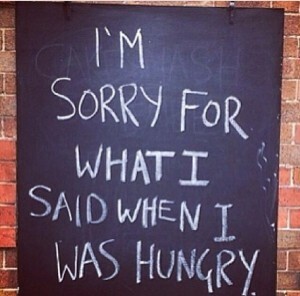 Ask anyone who knows me: hungry Emma = grumpy Emma. Following fast on it’s heels, they’ll tell you I’m always thinking about my next meal. It’s not uncommon for me to be planning dinner even as I’m digging into a burrito over lunch break. Right now, I’m thinking about the leftover Pad Thai that’s in the fridge for lunch, and what I’m going to cook for dinner… scrambled eggs? A salad thrown together from the random assortment of vegetables and leaves? I’m already salivating over the roast chicken and triple cooked sweet potatoes fries that will be tomorrow night’s dinner. For me, food is joy; a way of expressing creativity. The smell of sizzling oil as you pull the roast potatoes out of the oven; the slap of dough as you knead bread; the noisy burr of grinding coffee beans. The sounds and smells of the kitchen are home for me. Food is so much more than just fuel for the body. It’s comfort, it’s memory, celebration. And it’s a way to practice justice. In 4 short days, I’m changing my eating habits for a week. For the 1.2 billion people living below the poverty line, food isn’t some hipster status symbol to show off (and I confess that I have used it as this, too). It’s a means of survival. I’m choosing to stand in solidarity with my brothers and sisters around the world, and live off their level of income for 5 days. From Sunday 20 – Thurs 24 April, I’ll be living off £1 a day for food and drink. It’s only one week, and it’s only food and drink. Let’s be honest – it’s a pretty easy sacrifice to make in comparison to the decisions faced by millions around the world each morning: do I eat today, or do my children eat? Food today or life saving medicine tomorrow? Christian Aid is an organisation that insists the world can and must be swiftly changed to one where everyone can live a full life, free from poverty. From Afghanistan to Zimbabwe, their essential purpose is to expose the scandal of poverty, to root it out from the world and to challenge structures and systems that keep people poor. During my Live Below the Line week I’m raising money for Christian Aid. I had the extreme privilege of volunteering and working for Christian Aid a few years back, and I was blown away by the life-transforming potential of their work. If you can, please give generously to this incredible charity. Next week, I know I will get hungry, I will get bored of rice, I will have coffee withdrawal symptoms, and I will almost definitely be grumpy. Forgive me – it’s for a good cause.